Iowa Senator Chuck Grassley says he’s encouraged by what’s being said about progress so far in the talks between the U.S. and North Korea. President Donald Trump says he plans to sign an accord with North Korean leader Kim Jong Un, but the subject matter is still unknown. “I think that it would be smart for all of us to reserve judgment until we see the printing of it,” Grassley says. The summit in Singapore marks the first time a sitting U.S. president has met with the leader of North Korea. “I’m going to hope for the best and hope it works out,” Grassley says. President Trump made comments during the recent G-7 summit that are perceived as lashing out at key U.S. allies — including Canada, Germany and France — over trade. Grassley says Trump is doing his best to level the playing field. 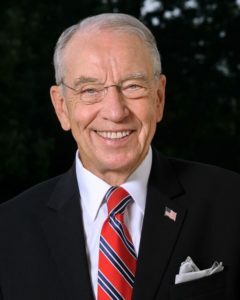 “He’s shooting for the moon and I think it’s legitimate to shoot for the moon,” Grassley says, “because you see, the countries he’s dealing with have higher tariffs than America does for most of our products that we import.” For example, Grassley says Canada has a 279% tariff on dairy products, while many European nations have trade bans in place on American grains due to GMO practices.